Discussion in 'Databank' started by Korvo, Oct 17, 2018. Wreans (Γλώσσα., lit. "Γόνος"_meaning "[the] Offspring"_or "[the] Scions" of Wrea) were a Near-Human sentient amphibious species native to the planet Wrea. A tribal people unified in a planet-spanning hegemony, the Wrean are dwellers of the sea, building the planet’s vast cities in the ocean depths. 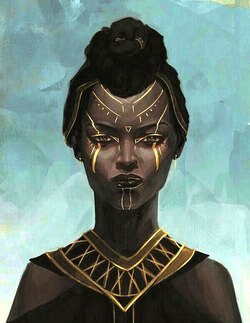 Relatively isolated due to their location in near the Smuggler’s Run asteroid belt, Wreans are a curious and cultured people with a deeply spiritual, if primitively understood, reverence for the Force. Often considered to be aesthetically analogous to baseline Humans, Wrean females averaged 1.5 meters in height, with males averaging at 1.8 meters. Due to evolving aquatically and dwelling at the bottom of Wrea’s oceans, Wreans have denser muscle tissue to withstand extreme pressures and highly acute vision with minimal light. Because of their particular physiology, Wreans are resilient to the cold, possess a wiry strength and are noticeably more slender of build than Humans. The most distinguishing feature of Wreans are their gills, with three existing on both sides of their necks. Wreans possess compact lungs, enabling them to breathe on land or underwater, extracting oxygen from either environment. These gills can be tightened and seal outside of water, and their nostrils can likewise seal underwater. Outside of water, Wreans habitually cover over their gills. Although outwardly seen as enabling them to blend in and become indistinguishable from Humans, there is a practical purpose to this as well. Beneath the cover, Wreans apply a gelatinous adhesive to keep their gills from drying out; without it, Wreans exhibit diminished stamina and endurance. Although they can adapt to most environments, Wreans also struggle with very bright environments or particularly arid places (such as Tatooine, respectively for both). With long exposure to extremely hot environments that lacked humidity, Wreans were susceptible to their skin painfully cracking and rapid dehydration, which could become lethal in time. As one would expect, Wreans are exceptional swimmers that can fare well in fresh or salt water environments. Although fully capable of breathing air, the experience was initially quite painful for them. Wreans that sought to leave their homeworld and venture into the galaxy had to spend weeks adapting their bodies to breathe dry air, lest their bodies go into shock and potential asphyxiation. In contrast to most amphibians, Wrean young are born live, in a similar way to mammals. Like most species that do not propagate asexually, reproduction requires both a male and a female. As a Near-Human species, Wrean are technically capable of sexual reproduction with Humans and most other Near-Human species, although their relative isolation makes such unions very rare. Wreans become sexually, physically and psychologically mature after two decades. Although technically possible, Wrean young often cannot breathe air easily, to the point that suddenly being forced to could result in a traumatic seizure, shock or potential asphyxiation. Wreans have a natural athletic build, a wiry physical strength and dense skin that imparts unto them an inborn resilience toward cold temperatures and high-pressure environments. Due to their evolution at ocean floors, Wreans have very acute hearing, extending into infrasound, and have eyesight making them capable of seeing extremely well with very scarce light. As an amphibious aquatic species, Wreans also possessed compact lungs, enabling them to extract oxygen through gaseous or liquid mediums. As a ocean-dwelling species, Wreans can breathe in both salt and fresh water, are superb swimmers with extractable “webbings” between the digits of their fingers and toes. Due to their adaptation to humid and aquatic environment, Wreans have a natural intolerance toward extended periods within hot and dry environments. Prolonged exposure even induces detrimental physical decay, causing their skin to painfully crack and at its worst, can cause them to rapidly dehydrate. Extremely bright lights or piercing sounds also affect Wreans more intensely than most other Near-Humans, if caught by surprise. Wreans are omnivorous, although their dietary consumption leans more heavily toward carnivorous. Wreans mainly eat cephalopods, cetaceas, bivalve molluscs, crustaceans and aquatic craniates, although they also supplement their diet with many species of seagrass, kelp and reeds. Curious and inquisitive, Wreans are naturally inclined toward exploration and the unknown. Although each of the tribes that make up Wrean society are distinct from one another, they are as a whole a spiritual people, not unlike the Mirialans, and to many in the galaxy, this results in the Wrean appearing as backwardly superstitious. Although Basic and Bocce are known languages among them, Wreans still maintain their own indigenous language, known as Γλώσσα. Although a constructed verbal language, Γλώσσα is only able to be fully understood underwater, as it combined phonetics with patterned infrasonic emissions. This causes Wreans to have very distinct voices that carried a “flanged” effect (think Turians from Mass Effect). This communication is possible due to the Wreans having two sets of vocal cords, four in total, one which produced sound at conventionally audible levels, and the other which chiefly acted to emit the infrasonic emissions. Although audible to other species, who simply hear the Wrean speaking at what seems like two tones at once (with their second vocal cords sounding slightly deeper and more monotoned), it was only truly perceptible by any species that could hear infrasound. These infrasonic emissions were very weak, however, and did not carry through the air effectively enough for Wreans to properly hear them unless situated very, very closely together. As such, Wreans best communicated to each other in Γλώσσα when water, not air, was the medium around them. Neither patriarchal nor matriarchal in nature, the Wrean people instead governed themselves quasi-theocratically. The most prominent leaders among the Wreans were called the “Fatemarked”_(Γλώσσα, “Δεξιοτέχνης”. ; lit. meaning “Fated One(s)”.). The Fatemarked originally were not so much a collective body as they were shamans, mystics, and seers local to individual tribes. Above all else, the Fatemarked were entrusted with peering into the future so as to lead their tribes in order to elude catastrophic ends as they competed with the fierce predatory creatures of Wrea’s deep. 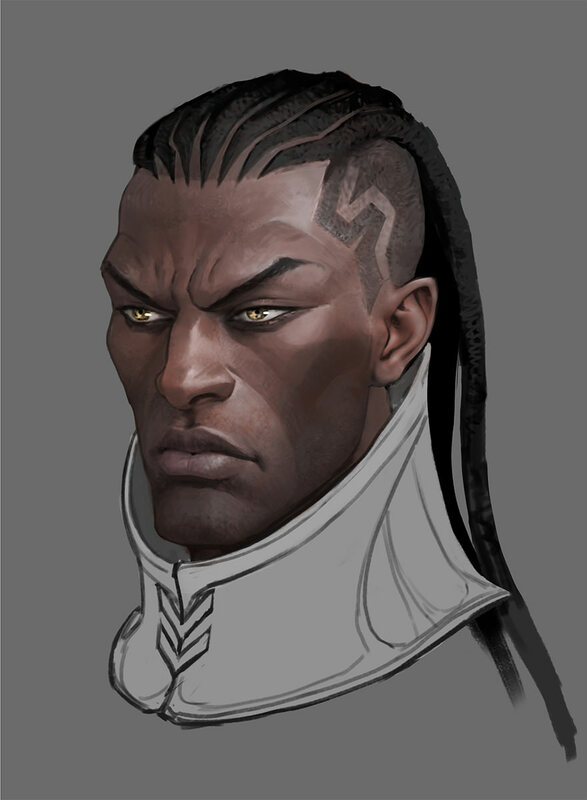 Although all of the highest leaders among the Wrean tribes were usually Fatemarked, not all Fatemarked were leaders. Some were seen as unfit for duty, had no desire to lead, or simply lacked the gift of foresight. Consequently, the prominence of the Fatemarked in Wrean society did not mean there was an exclusion of the “Willmarked”_(Γλώσσα, “Ελεύθεροςψυχή”. ; lit. meaning “Freed Soul”.) attaining a highly respectable position, or even one of leadership, alongside a Fatemarked. While the Fatemarked fulfilled the roles of leaders and priests, the Willmarked often took on judiciary roles and established laws that binded the various tribes, and later, the Tethysian Republic as a whole. Wreans tribes were ruled in a dualistic fashion; a chieftain and a shaman, and both were expected to make arrangements to ensure that balance was maintained. For instance, in the event of an absence, a Willmarked was expected to train and make qualified a Fatemarked, and vice versa. The division between the Fatemarked and the Willmarked was not only reflected socially, but also culturally and, by extension, spiritually. The Fatemarked were called such due to the prevailing belief that when they perished, their souls were claimed by the High Goddess of the Wreans, Wrea (or “Θάλασσαμητέρα”, meaning “Mother of Seas”) to the realm of the gods, where they became the ancestor-spirits that watched over their family’s tribes, granting them protection. The Willmarked were called such due to the belief that they were capable to weaving their own fates, according to the strength of their wills, and upon their deaths, would be reborn according to the merit of who they were, in the “Great Cycle”_(Γλώσσα, “Κοσμικός Πρότυπο”. ; lit. meaning “Cosmic Pattern”.). The Fatemarked were considered an existence outside the Great Cycle; a Willmarked would never be reborn as a Fatemarked, and a Fatemarked has never, nor could ever, be reborn into the Great Cycle. Following the ”Age of Unity”_(Γλώσσα, “Ενοποίηση”. ; lit. meaning “Consolidation”.) and the joining of the seven hundred tribes, Wrean society restructured into the “Tethysian Republic”_(Γλώσσα, “Δημοκρατία της Τηθύς”. ; lit. meaning “Republic of Tethys”. ), which was both commonly and incorrectly called the “Wrean Republic” by outsiders. While still maintaining many of the pre-Unification practices, such as shamanism and the dualistic governing system, the establishments of the “Megalopoleis”_(Γλώσσα, “Μεγάλεςπόλεις”. ; lit. meaning “Great Cities”.) gradually changed the Wreans from being a nomadic people to concentrating themselves in large cities. Although several hundred spanned Wrea, the most influential were the industrial capital of Αἰγαίων (or “Aegaeon”), academic city of Γαλήνη (or “Galene”), the holy city of Λευκοθέα (or “Leucothea”) and the government’s capital of Wrea, Θάλασσα (or “Thalassa”). Unlike many other species, early Wrean civilization was not marked by frequent internal wars, invasions or other forms of political strife. Indeed, for much of their history, Wreans were not even unified at all, instead living as nomads at the bottoms of the oceans in family groups, breaking off only when their numbers became too many. This pattern of life persisted until the 9,129 BBY, when Wrea was discovered and subjected to the Δρένταν Εισβολή (or “Draedan Invasion”). With the Draedans of the time seeking to expand and establish their own hegemony, a campaign began to subjugate and enslave the native Wreans. The shamans of the Wreans were largely able to foresee that a significant event was approaching, but not its nature, and thus most Wrean tribes simply went into hiding. Active conflict between the Wreans and the Draedans did not actually occur until almost a year and a half later, in 9,128 BBY. 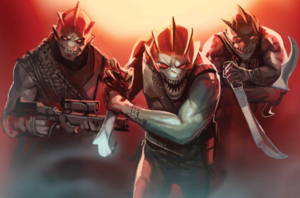 For the following two years, the Draeden Invasion drove most of the Wreans into open conflict, with the Draedan-occupied waters becoming the grounds of intense guerrilla warfare. Because of the scale of the conflict at the height of the fighting, the Draedan Invasion would later become known as the Ψρεα-Σεσιδ Πάλη (or “Wrea-Sesid War”), and ultimately drew the attention of a Republic exploratory expedition. Although the Republic did not intervene, the Wrea-Sesid War managed to achieve attention on the galactic scene. Through that, Wrea was ultimately received vital aid from the Jedi Order by means of the Kingdom of Mon Cala, who had themselves fended off Draedan conquerors decades earlier. Although distrustful of the new outsiders, the Wreans ultimately accepted the aid of the Kingdom of Mon Cala, which greatly turned the tide of the war in their favor, beginning with what would later be called the Battle of Leucothea, which saw the Wreans reclaim their sacred waters, which would later become the site of the holy city. By the turn of 9,125 BBY, the Wrean-Mon Cala alliance had effectively pushed the Draedan to the point where they were forced into negotiations, which concluded with the signing of the Treaty of Thalassa, the site of the last battle, where the Draedan were forced to pay reparations and barred from entry into the Gaulus Sector (although tensions between the Wreans and Draedan would persist down to the current day). During the Wrean-Sesid War (9,129 BBY―9,125 BBY), the Wreans began their mass-unification efforts, establishing fortified strongholds which would eventually become their greatest cities, including Aegaeon, Galene, Leucothea, Eurybia and Thalassa. After the war’s end and the political alliance that emerged between the Wreans and the Kingdom of Mon Cala, Wrean development exponentially accelerated. In the following decades, many Wreans migrated to Mon Cala, returning to Wrea to aid in their people’s modernization. In the generations to come, Wreans began to return to their ancestral passions of exploration and went about traveling to various corners of the galaxy, braving unknown sectors of the Outer Rim territories. Although eventually offered membership into the Republic, the Wreans ultimately refused, preferring their own independence and chosen alliances. Many Wreans, particularly the Fatemarked, also found a level of fascination with the many Force Orders of the galaxy. Because of the role they played in intervening through the Wrea-Sesid War, the Jedi Order became a special source of interest among the Wrean Fatemarked, although few would opt to join. As the galaxy eventually became more polarized and war-ravaged, most Wreans chose to either remain on their homeworld or to keep far from the sectors of space where battles were constantly breaking out, making them a rare sight in the galaxy. Although recognizing the Exiles (and later, the Sith) as being distinct from the Jedi Knights, the majority of Wreans had little interaction with them, and in turn lacked an understanding of what made the Sith and the Jedi wholly different. Because of this, most modern Wreans have returned to the their quasi-isolationist nature, choosing to remain separate from the galaxy until the century-long war comes to its end. Expanding a barebone Canon species, which is being detailed for a character I’m actively creating… plus, who doesn’t love a good Atlantean? black manta? the great exiled atuma warlord of atlantis?